Including a nearly free 30000 Shield G Guardian for Altmile Decks! Cont (GC) GB1 Brave: This Unit gains Shield+5000. Auto: [Soul Blast 1] When this Unit is placed on (GC), if you have an “Altmile” Vanguard, you can pay the cost. If you pay it, during that battle, this Unit gains Shield+10000. Auto Brave: When this card is placed on (RC) due to a card effect, if you have an “Altmile” Vanguard, during that turn, this Unit gains Power+5000. For Today’s Card, we’re introducing, from Character Booster “TRY3 NEXT” (on sale December 9th), a 《Royal Paladin》 “Altmile” Support G Guardian “Divine Defense Sacred Knight, Igrain” and the Grade 1 “Preparing For Battle Knight, Pollux”. “Divine Defense Sacred Knight, Igrain” is a G Guardian that’s the grown up form of “Holy Knight Guardian”. If your Vanguard is Altmile, for 1 Soul Blast it gains Shield+1000! And if you’ve achieved 【Brave】, it gains 5000 Shield without a cost. If you activate both of its effects, it’ll be a 30000 Guard! If you don’t achieve 【Brave】, it’s still an excellent 25000 Guardian. It could be said that when making an “Altmile” Deck, it’s a required G Guardian. 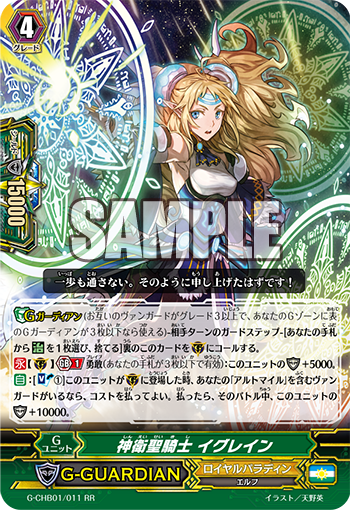 When “Preparing For Battle Knight, Pollux” is placed on the field due to a card’s effect, and your Vanguard is “Altmile”, it gains Power+5000! So if you Call it with the Call ability of “Knight of Heavenly Decree, Altmile”, it essentially gains a 9000 Power boost, making it an essentially 16000 Power Attacker. It’s also Good if you combine it with cards like “Holy Dragon, Brave Lancer Dragon” or “Hope Song Angel”, that can Call cards with the Brave ability! Aim to activate the effect of “Pollux”. The Character Booster “TRY3 NEXT” contains many cards that support Altmile and 【Brave】. So keep an eye out for further information from here on out.